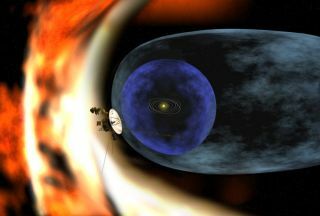 Artist's rendering depicts the Voyager 2 spacecraft as it studies the outer limits of the heliosphere - a magnetic 'bubble' around the Solar System that is created by the solar wind. Scientists observed the magnetic bubble is not spherical, but pressed inward in the southern hemisphere. NASA engineers have fully revived the far-flung Voyager 2 probe on the edge of the solar system after fixing a computer glitch that scrambled its messages home for nearly three weeks. A single bit flip in one location in the 33-year-old probe's memory storage caused the problem, and was remotely reset Sunday by engineers at NASA's Jet Propulsion Laboratory in Pasadena, Calif. After a computer reset, the Voyager 2 is back on track, they said. The malfunction began April 22 while Voyager 2 was flying 8.6 billion miles (13.8 billion km) from Earth in the heliosphere, the magnetic bubble that surrounds our solar system. Mission scientists could not decipher the probe's science data messages and put the spacecraft in an engineering mode to just send health updates to Earth. The actual cause of the computer glitch is still unknown, NASA's Voyager 2 project manager Ed Massey told SPACE.com. Memory bit flips and other electronic problems have affected spacecraft, and even Voyager 2 and its twin Voyager 1, in the past. But they occurred when the spacecraft were much closer to Earth, around 1 or 2 astronomical units (AU). One AU is the distance between the Earth and the sun, about 93 million miles (151 million km). That's close enough for their onboard systems to be affected by the electric charge of the sun's solar wind, Massey said. "In some spacecraft that are closer to the sun one could think of single event upsets caused by solar activity. But we're so far away, it's hard to say that's what caused it," he added. "We're like 93, 94 AU out." The two Voyager probes are currently the farthest human-built objects from Earth. Voyager 1 is about 10.5 billion miles (16.9 billion km) away from Earth and in perfect health. Their signals take nearly 13 hours to travel to NASA's worldwide Deep Space Network of listening antennas and back. After detecting the problem on Voyager 2, engineers ordered Voyager 2 on May 6 to only send engineering data to Earth until they could solve the glitch. That occurred on May 12, when engineers realized that a single memory location had been changed from a 0 to a 1. By May 19, commands to reset the bit were sent to Voyager 2 and the probe resumed sending science data to Earth on May 22.? NASA announced the deep space operation's success this week. NASA launched Voyager 2 in 1977 primarily aimed at studying Saturn, though the spacecraft gained fame for its so-called "grand tour" of the solar system that also included flybys Jupiter, Uranus and Neptune thanks to a planetary alignment that only occurs once every 176 years.? Now, both Voyager 2 and Voyager 1 are headed out of the solar system entirely. Scientists hope the data they are sending back will help answer questions surrounding the magnetic bubble around the solar system. No known source of magnetic or electric field exists in the membrane which separates the heliosphere from interstellar space, said Massey. Voyager 2 has occupied this region since 2007, said Massey, and has not seen any problems. "The real question is whether we'll ever know," He said.